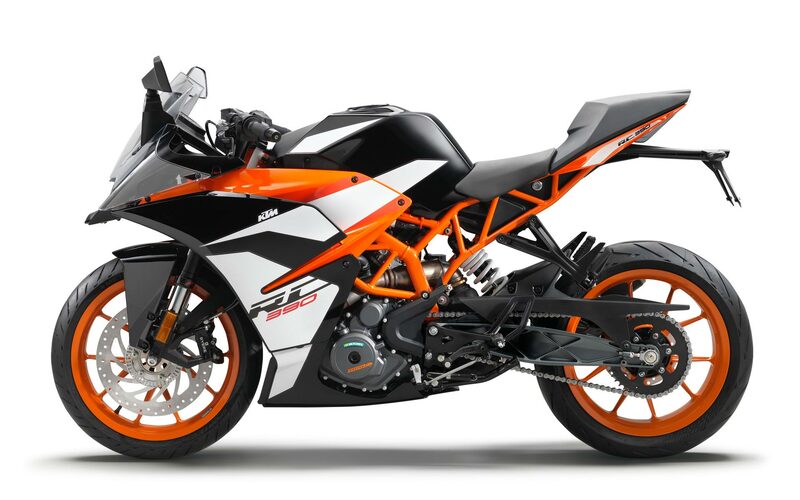 The guarantee for smooth throttle response, not just no throttle control cable: The RC 390´s ride-by-wire system ensures perfect application of the readily available and plentiful torque. It also electronically translates the throttle commands of the rider into throttle valve positions perfectly suited to the riding conditions. The DBW system is fully compliant with the strict DIN 26262 safety standard from the automobile sector. Equally lightweight as stable, the 17in orange painted cast light alloy wheels are fitted with grippy Metzeler tires – 110 mm wide at the front and an impressive 150 mm at the rear. The tires impress with tremendous grip in both wet and dry conditions, as well as providing supreme durability. The two-part seat offers first class supersport ergonomics with perfect support for rider and pillion. With a seat height of 820mm enables the rider to have a secure stand while also being high enough for sporty use and real big-bike feeling. For MY 2017, rider’s seat will be even more comfortable with 12 mm thicker cushion. For MY 2017 the clutch and the brake lever are adjustable, to get the pressure points exactly to where the rider wants them.